Welcome to the Future of Retail Membership helps brands and retailers, plus the agencies that support them, optimize and innovate at every step of the customer experience journey. Our Basic Membership grants access to our latest retail innovation news through our newsletters, database and webinars. Innovation waits for no one. For those who need a constant dosage of retail inspiration, we provide a bevy of newsletters that cater to a variety of industry lenses and user needs, such as weekly highlights, store packaging design, apparel & beauty, and hotels, hospitality & travel. 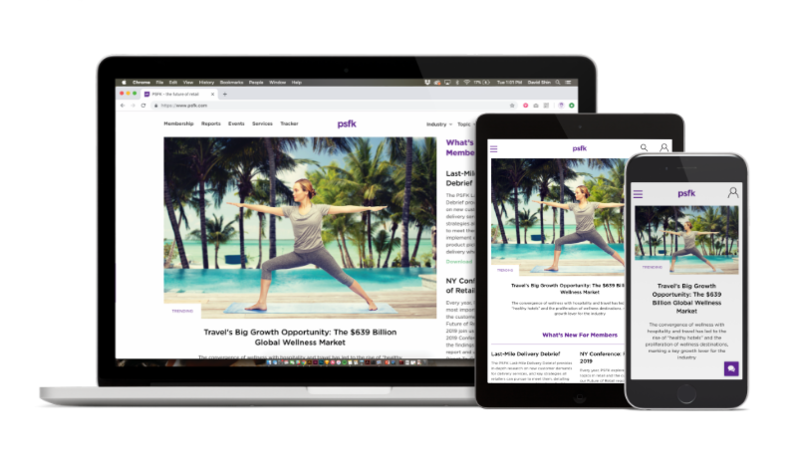 By logging onto PSFK.com, our members have unrestricted access to our searchable database of 100K+ research insights, members can pull from a range of quantitative, expert-enriched and analytical insights in preperation for company and corporate deliverables and presentations. For members whose curiosity never wanes, we provide monthly report-based webinars that help our community better contextualize our findings.